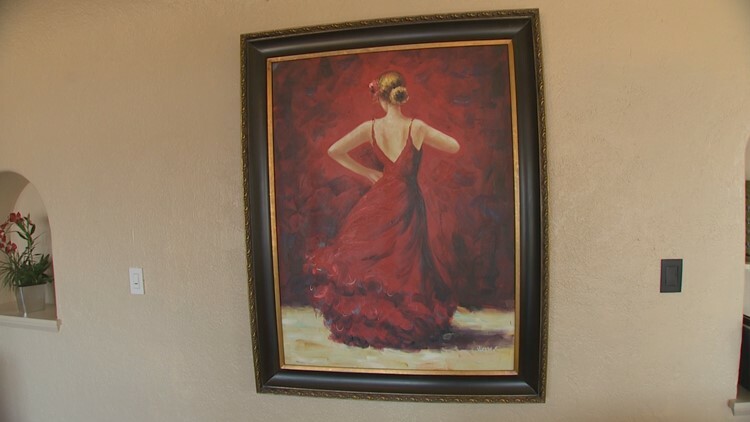 The lady in red in the living room is Miles Zuluaga's muse. He spotted the painting that hangs on the wall in a Federal Way thrift store. "Just caught my eye and I go, 'I have to have that.' So she's kinda been my...inspiration to stay on track with my theme," Miles says. Miles Zuluaga found this painting at a Federal Way thrift shop. As you stroll through the mahogany door, custom-crafted in Mexico, you might as well be in Cabo. But you're actually in Tacoma. "You walk through that gate, you're not in Browns Point. You're not in Washington. You're just transported to Mexico. You should have a marguerita in your hand," says Keller Williams Broker Christine Bowers. The 1931 Mission-style home has always had a south of the border feel. But Miles took it to new heights. "I just took over and gave it a theme. Gave it some mood and some character and some passion and emotion." He says it's been a 20-year project. The master bedroom deck faces stunning, westward views, including the Browns Point Lighthouse just to the north. That hovers above another deck off the living room where windows are purposely lowered. "From either a sitting position or a standing position, you're able to take in all of these views," says Christine. And yes, Miles says the lady in red stays with the house. The property is offered at $1,195,000. That's 23 million pesos.